This Database exercise Project is to help Python developer quickly learn database programming skills by solving the questions and problems from the real world step by step. What included in this database programming exercises? 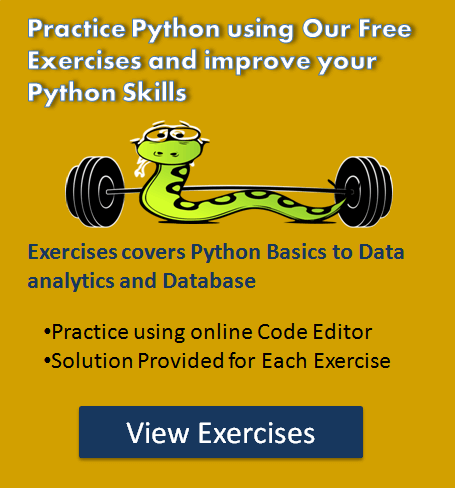 Now it has 5 exercise question, which simulates the real-time questions, and each question contains a specific skill you need to learn, When you complete each question you get more familiar with database programming in Python. Note: There are also some tips and helpful learning resources for each exercise, which help you to solve the exercise. You can refer to the following tutorials to solve this exercise. In this exercise, We are implementing the Hospital Information System. We are using two SQL table Hospital and Doctor. The SQL query to prepare the required tables is below. The solution provided at the end of each question. I request you to solve all the questions by yourself. Next, When you have done with your solution, you can refer to my solution. Use any database you want. (MySQL, PostgreSQL, SQLite or any). Also, You can use any driver (DB module) for example MySQL Connector or psycopg2 or any. You can add more functions, as needed. I have prepared a create table and INSERT query which prepares a required data for us so we can start our exercise. Note: These queries are tested using MySQL. You can update as per your database server. These tables should look like this. Let see the exercise questions now. Implement the functionality to connect to the database and print its version. Write SQL query to get database server version. Connect to the database and use cursor.execute() to execute the query. cursor.fetchall() to fetch all the records. Implement the functionality to read the details of a given doctor from doctor table and Hospital from hospital table. i.e., read records from Hospital and Doctor Table as per given hospital Id and Doctor Id and display hospital and doctor information. 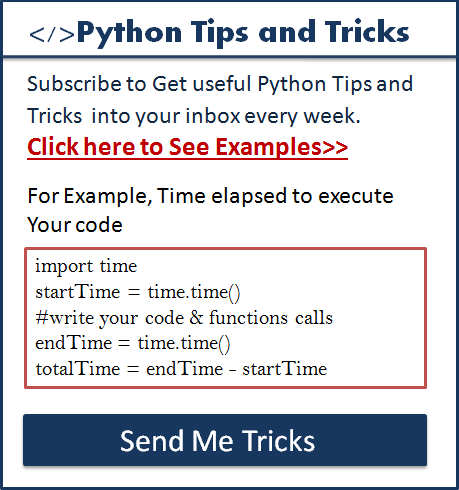 How to use database parameterized query in Python. #Call getDbConnection method to get connection. 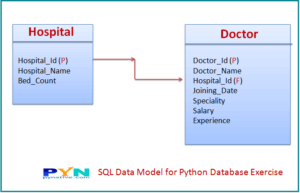 sql_select_query = """select * from Hospital where Hospital_Id = %s"""
sql_select_query = """select * from Doctor where Doctor_Id = %s"""
Implement the functionality to create a list of doctors as per given Speciality and salary greater than as per the input amount. Use cursor.execute() to execute query. sql_select_query = """select * from Doctor where Speciality=%s and Salary > %s"""
Implement the functionality to fetch all the doctors within the given Hospital Id. You must also display the hospital name of a doctor. call getHospitalName(id) in GetDoctordWithinHospital() by passing doctor’s hospital id to get hospital name. Define the parameterized query and Use cursor.execute() to execute a query. sql_select_query = """select * from Doctor where Hospital_Id = %s"""
You know as of now Experience column value for each doctor is null. Implement the functionality to update experience of a given doctor in years. Doctor table has the joining date for each doctor. Call getDoctorJoiningDate in the updateDoctorsExperience method to get given doctor joining date. To get a difference in a year, we can calculate the difference between today’s date and joining-date in years. After calculating the difference in a year, you can execute the update table query to update Experience of a given doctor. sql_select_query = """select Joining_Date from Doctor where Doctor_Id = %s"""
sql_select_query = """update Doctor set Experience = %s where Doctor_Id =%s"""
plz inform proper how to insert a form field data into Database. Shweta thank you for your comment. It is altogether a different topic. I created this exercise solely for Database operations from Python. You can read values from the form field and then pass it to a function which will insert into the database.